At eight minutes past two on Monday morning a vast floating palace dropped anchor proudly at Plymouth. 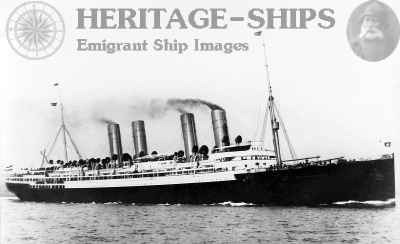 It was the Hamburg American liner, the Deutschland, with 600 passengers, and she had beaten the Norddeutscher liner, the Kaiser Wilhelm der Grosse, by 5½ hours (as reckoned by the Lizard), having crossed the Atlantic from New York in 5 days 7 hours and 38 minutes, or an average speed of 23-36 knots (that is nearly 27 miles) an hour, the best day's run being 549 miles. Passed Sandy Hook, 1.30 p.m.
First day's run, 507 miles; sea moderate, weather foggy. Second day, 535 miles; wind and sea moderate. Third day, 540 miles; sea moderate, foggy. Fourth day, 549 miles; gentle S.W. breeze. Fifth day, 345 miles; wind and sea moderate. Arrived at Plymouth 2.8 a.m. Distance run, 2,912 sea miles. Passage, 5 days 7 hours 38 minutes. Average speed, 23'36 sea miles an hour. The Deutschland is of German build. She is 686½ ft. long, 67½ ft. wide, and 44 ft. in depth. She has two masts, each being 335 ft. high, coal bunkers can hold 4,850 tons, which her 112 furnaces readily devour. Her crew totals 620 people and she has sleeping accommodation for 1,320 passengers, this being 264 first-class cabins and 736 berths. The Kaiser Wilhelm covered the distance between Sandy Hook and Cherbourg, 3,076 miles, in 5 days 17 hours 18 minutes, or equal to an average speed of 22.40 knots per hour. Her fastest time was 22.79 knots per hour. Her daily runs were 498, 514, 519, 520, 520, and 505 to Cherbourg. From Cherbourg the Kaiser Wilhelm came on to Southampton, passing Hurst Castle at three o'clock on Monday afternoon, and subsequently anchoring off Calshot Castle. Captain Engelhart and Chief-Engineer Baum both denied that their vessel was racing. 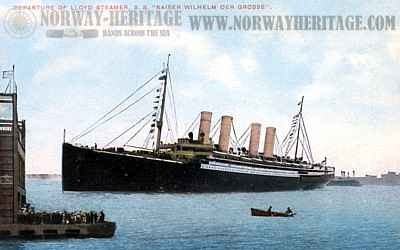 All things considered, the captain thought the Kaiser Wilhelm had made a fine passage, and but for the dead calm which prevailed said she would have made even better time, as under the circumstances it was impossible to get a natural draught for the fires. English shipowners are not discouraged by these records, for in the view of some of them the honour is somewhat barren. For instance, the Syren and Shipping, an excellent journal, points out that if the Oceanic, which has never tried to race, were to be run at the same rate as the Deutschland the increased cost would be £15,000 a trip. Nor is this by a long way the only additional cost the extra five knots represents. There would require to be not only a larger engine-room staff but also a very great addition to the already small army of highly trained and efficient stokers, as well as a heavy outlay in the up-keeping of machinery. This, roughly speaking, would bring the figure up to about £8,000 for a single run.